1. 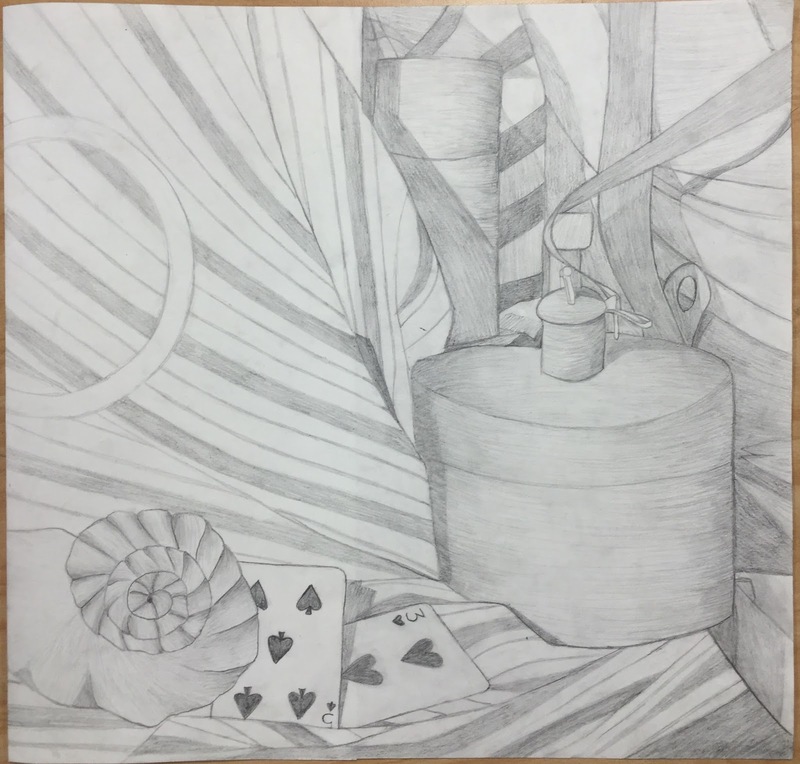 I think my final Still Life project turned out to be a good quality piece of work. The objects are all well defined and most of the page is clean and well-blended. One thing that I could've improved on is the amount of smudges throughout the piece. 2. A few objects are more realistic than others but you can tell what I have drawn. I included as many shadows as I could for example there's a shadow behind the card and in multiple places behind the fabric. Also I definitely could've used a wider range of values and made the whole piece darker but my style of art tends to be lighter and softer. 3. You can tell that the light source is in the top left because the right of the page is darker and the fabric at the bottom is darker. 4. The compositional sketches are very important because they gave us practice with getting shading and proportions correct. 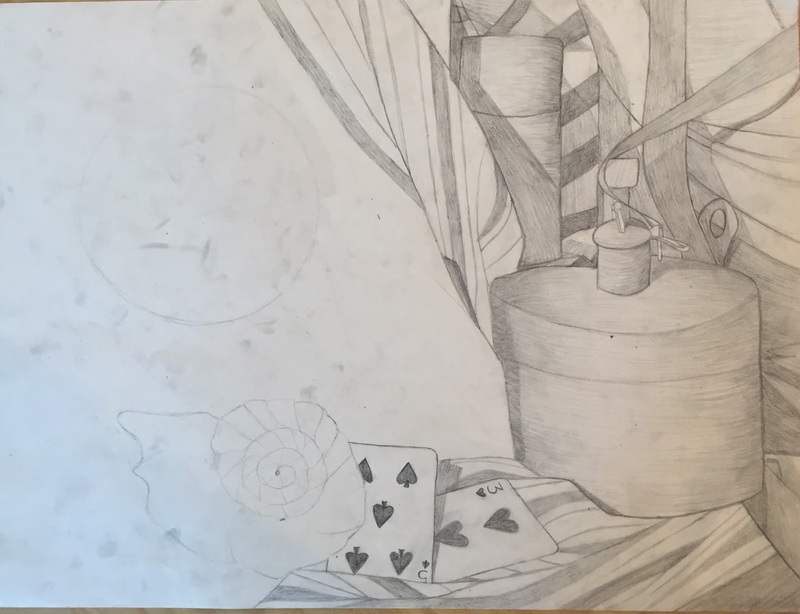 There were so many objects on the table that you had to really study all the their details in order to include all the shadows. By drawing the table over and over again I grasped the main elements of the objects in view. 5. The most successful parts of my drawing were the cards, the fabric and the shadows. The fact that my cards were so much lighter than the rest of the piece and had shadows made them stand out. Also my fabric has good movement because of the way I drew and layered the lines. 6. The proportions and perspective of my final piece turned out pretty accurate after practicing with the compositional and final sketches. I finally figured out where to place the large can in the front and how large to make it in order for the rest of my objects to fit in correct perspective on the page. 7. My eye is drawn to the top/middle right of the page because of all the shaded objects and layers. If the wall decoration to left on top of the fabric was finished the piece would've been a lot more balanced but it still has a pleasing composition. 8. Like mentioned in question 7 the eye is drawn to the top/middle right of the page. The large can in the front creates a center of interest because of its size and the amount of shadows that surround it. 9. This project took me a while but most projects do because of how particular I am. Shading takes me a while and I've always had problems with getting it just right especially on round objects. I could definitely improve on creating a darker range of values. 10. Like I mentioned before I really struggled with shading and creating value. To fix this I had to keep going over the areas I shaded and make them darker. Another thing I struggled with is keeping the piece clean because it constantly smudged and ruined the light parts of my piece. The only way to fix the smudging was to erase and redefine any shapes that got messed up. 11. 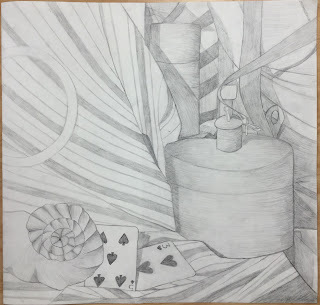 Still Life has taught me I need to work on shading and perfecting shapes. It has also helped me better understand value and how to create it. I can now look at an object and more easily figure out where the light source hits and the shadows form.